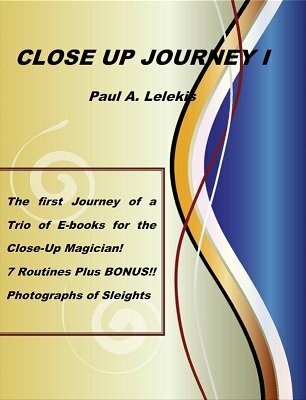 Paul A. Lelekis has released this first of a trilogy (three e-books altogether) of some great magic for the magician who is serious about performing close up. Photos of Paul's hands give every nuance for all of the sleights involved. In addition to seven excellent, time-tested effects, Paul has included an introduction that deals with HOW to perform, HOW to address your spectators and HOW to make your spectators feel important - the REAL secret of magic! As a BONUS, a step-by-step procedure (with photos of Paul's hands) of Paul performing the elusive Retention of Vision Coin Pass. Take advantage of Paul's years and years of study of this little understood, yet very important sleight. When you learn this pass, believe me – you will even fool yourself in the mirror. COIN OPENER – Perform a simplistic yet very powerful one-coin routine for the kids. You'll have them screaming. But when the Moms are looking on, they'll be even more amazed than the kids. FOR LOVERS ONLY! – Here is Paul's answer for an easy-to-do Anniversary Waltz. This compelling "fusion" effect is a very powerful moment for your spectators, and they will leave with a memento of their occasion that they will always treasure. Paul has been performing this version for many years. Oh, did I say it was EASY to do?! CSS – This is Paul's rendition of a Dai Vernon effect with a VISIBLE transposition of a signed silver coin for a signed copper coin. You're going to LOVE this one! It ROCKS! JUMPING JACKS – Want to do a beautiful Jack assembly with an amazing kicker that is done by the spectator? Make your spectator the HERO. A GREAT EFFECT! INSIDE-OUT ACES – This Nate Leipzig creation was his pet trick – as you'll see why. Paul has taken this effect to new heights with a hilarious kicker. This one is FUN to do! Trust me – you'll get a HUGE applause with this one. It just doesn't seem possible! BEATS ALL POKER SCAM – This is Paul's rendition of an effect from the Riverboat Gambling days. Instruct your spectators how a "slick" gambler will take your last penny with this routine that allows your spectators to join in. Even though the spectators control EVERY nuance of this Poker game – the dealer STILL gets the four ACES! UP AND DOWN – Two selections are found by two predictions made earlier by the performer. This is a brilliant, self-working creation by The Professor Dai Vernon.